There's more to corn on the cob than yellow kernels and mouthwatering juice. They can also be the makings of a beautiful flower. With a few corn husks, some wire, and tape, your fourth grader can create a lasting piece of art while getting in touch with his roots. Just like early American settlers, kids can use corn husks for everything from decorations to making baskets. Why not start with a simple flower? Natural corn husks are durable and attractive (like a fancy coat for corn) but once they're stripped away, they're usually forgotten about. Why not get in touch with your child's roots (and the natural world) by putting corn husks to good use? What use you ask? Decorating the home! 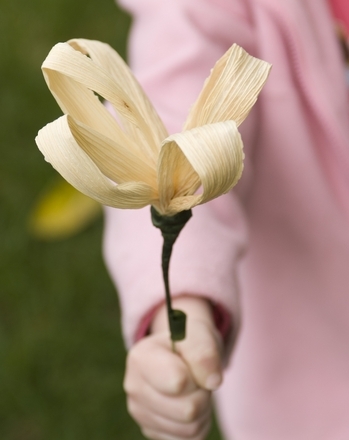 Have your child decide if he wants his corn husk flowers to be different colors or if he wants to use the natural tan colour of the husks. If bright colour is what he's after, simply soak your husks in regular fabric dye overnight and then let them dry in the sun. When choosing fabric dye, have him think about what colors he wants the petals to be and what colour he wants the centre of the flower(s) to be. Tear the husks lengthwise into strips about 3/4 to 1 inch wide. You’ll probably have few that look raggedy. You'll want to use a raggedy one for the centre of your flower. 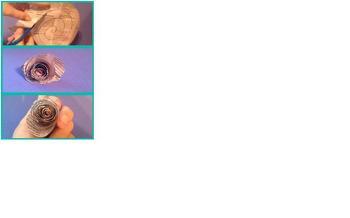 Have your child roll it into a tight bundle and then tie it up with green florist wire. Now attach four more "husk petals" by repeating the step above. When you're finished you should have a five-petaled corn husk flower. 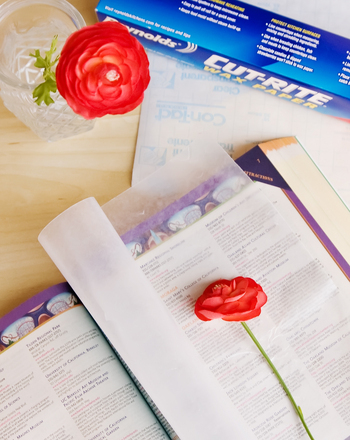 Trim off any ragged edges at the ends of the petals, so that you have a nice point to the flower. To make the stem, take a piece of heavy wire (about 12” long) and use needle-nosed pliers to bend the top into a “u” hook shape. Now push the straight end of the wire through the middle of the flower, pulling it through until the hook end is buried in the centre of the flower. Go green! Use the green floral tape wrapping around the wire stem. Careful here . . . this stuff is sticky! Repeat for as many flowers as your child likes. Using different colors it's easy to make a bouquet . . . and the perfect gift for mom! While you're at it: Talk to your child about other things he could make using corn husks. Discuss the way Native Americans and early American settlers used nature to create useful items like bowls, baskets and even shelters. What else could he make using nature? What else could a corn husk be used for? 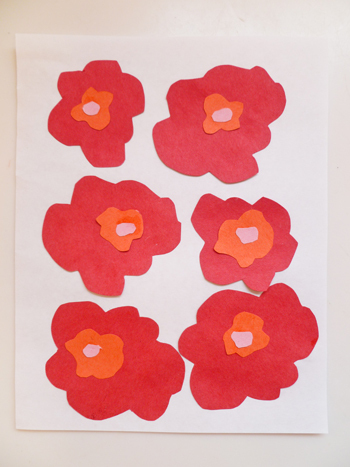 Your child can cut her way into making a fun collage of mod-style flowers that will dazzle and delight! 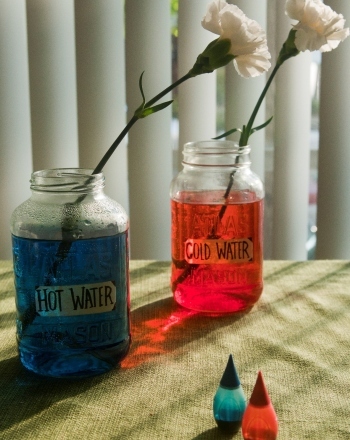 This science experiment tests whether warm or cold water works best in making cut flowers last longer. Challenge your fourth grader to help Emma put together a beautiful bouquet by tracking down the coordinates for a bunch of flowers. 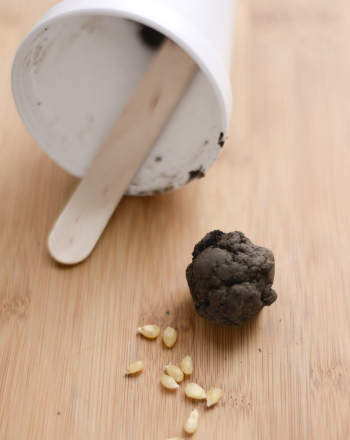 Make a seed bomb and let your junior guerilla gardener spread flowers far and wide. 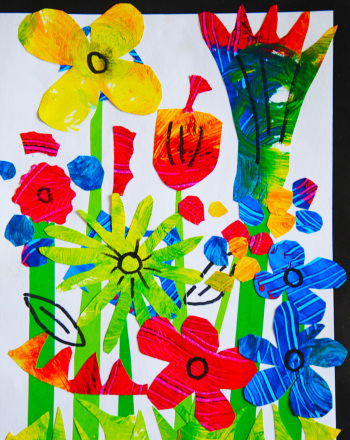 Your child can create a vibrant and dazzling array of flowers by blending and scraping into paint, and then creating a collage. 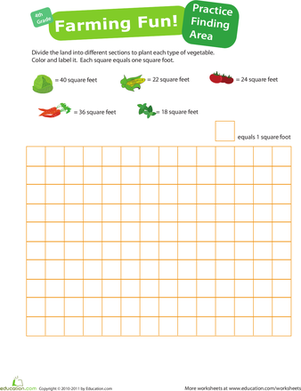 Practise Finding Area #4: Farming Fun! 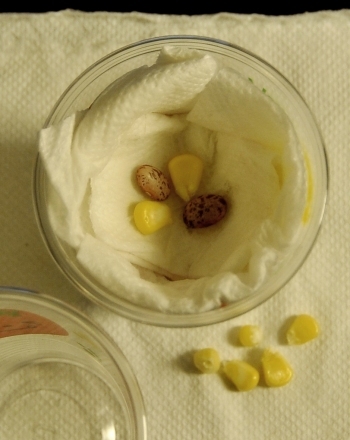 Lettuce, corn, tomatoes ... How will it all fit? 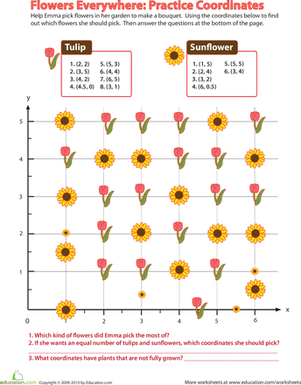 Give your fourth grader some geometry practise with this charming worksheet.